For over 37 years Meehan Military Posters has been the only firm devoted solely to original military posters from around the world. 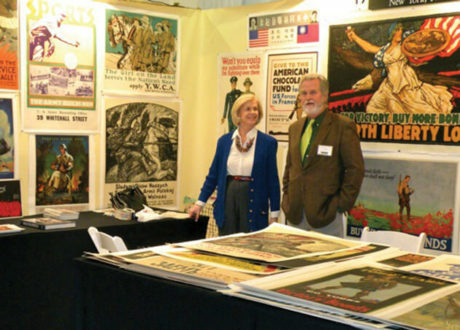 Meehan Military Posters was launched in 1982 by owner Mary Ellen (Mel) Meehan and her brother, Jim, a trained historian specializing in the world wars. Mary Ellen Meehan is a graduate of Manhattanville College and did graduate work at Princeton University and Indiana University. She was a curator at the Indianapolis Museum of Art for two years, where she hosted a weekly show on the arts on WISH-TV (CBS) every Sunday morning. She then taught 19th and 20th century art history at Indiana University for 12 years. When Ms. Meehan returned to New York, she joined friends at the Military Bookman and it was at that time she formed Meehan Military Posters as a stand alone business in 1981. She occasionally lectures at NYU and Columbia on posters in the History Departments of both universities. At Meehan Military Posters, we look at posters as precious historic relics often of considerable artistic excellence. We also take great care and offer conservation backing on all of our posters. We hope that our discerning customers will continue to enjoy and benefit from our long standing commitment to selling the widest possible selection of war posters available in the very best condition possible. Our military posters are great for any art or history enthusiast of topics including World War 1 and 2, the Chinese Cultural Revolution, Korean War, and Vietnam War to name a few. They also make great gifts for anyone who has served in the military including the US Army, Navy, and Marines, as well as other various branches. If you have any questions regarding our posters, or booking a speaking engagement please contact us directly.